The Hamerkop’s behavior is unlike other birds. One unusual feature is that up to ten birds join in “ceremonies” in which they run circles around each other, all calling loudly, raising their crests, fluttering their wings. Another is “false mounting”, in which one bird stands on top of another and appears to mount it, but they may not be mates and do not copulate. Partial view of nest. A piece of bright-coloured plastic is visible in the center. The strangest aspect of Hamerkop behavior is the huge nest, sometimes more than 1.5 m across, comprising perhaps 10,000 sticks and strong enough to support a man’s weight. The birds decorate the outside with any bright-coloured objects they can find. When possible, they build the nest in the fork of a tree, often over water, but if necessary they build on a bank, a cliff, a human-built wall or dam, or on the ground. A pair starts by making a platform of sticks held together with mud, then builds walls and a domed roof. A mud-plastered entrance 13 to 18 cm wide in the bottom leads through a tunnel up to 60 cm long to a nesting chamber big enough for the parents and young. 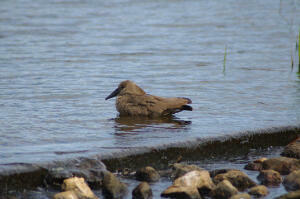 There are many legends about the Hamerkop. In some regions, people state that other birds help it build its nest The ǀXam informants of Wilhelm Bleek said that when a Hamerkop flew and called over their camp, they knew that someone close to them had died. Scopus, a database of abstracts and citations for scholarly journal articles, received its name in honor of this bird, as the Hamerkop is renowned for its superior navigation skills.